Can I Copy Windows 10 System Files to Another Drive? - Ask Leo! Copying, moving, and licensing Windows 10 isn't nearly as simple as we might like. Can I copy Windows 10 system files to another drive and boot from it, assuming all other computer components are original to the first drive? I want to keep my Windows 10 license. Taking your question literally, the answer is no. You cannot simply copy Windows (or pretty much any installed operating system) from one drive to another, or one machine to another, and have it work. Windows is too complex. However, if what you’re really trying to do is, say, replace a hard disk, or move your Windows installation to a different machine, the answers get more complex — and in some cases, more promising. You can’t simply copy Windows from one hard disk to another. You may be able to copy an image of the hard disk to another. A reinstallation of Windows is typically required for all other scenarios. Whether your license will transfer depends on the differences in hardware. I’m assuming from your question that you literally want to copy the files you find on your hard disk to another hard disk. For example, you might click on the C:\ drive in Windows File Explorer, and then drag and drop that to another hard disk on the same machine. The boot loader, required to load Windows at start time. Files the system is currently using. Files that have been intentionally hidden by the Windows installation. Probably more things I can’t think of. Even if it did copy everything, placing an operating system on a drive requires an installation or setup program. As we’ll see below, that process doesn’t copy an existing installation, but is designed to install and set up everything the operating system requires to run. It’s a lot more than just copying a few files. Conceptually, replacing a hard drive is pretty simple, but the devil is in those details. More here: How Do I Transfer My System to a Replacement Drive? There is one scenario where a form of copying will work. It’s an important scenario for disaster recovery: hard disk replacement. Rather than copying files from one hard disk to another, imaging (or cloning) a hard drive operates at a much lower level. It copies absolutely everything that’s on a hard disk, making no changes as it does so. The net result is that you can indeed “copy” one hard disk to another and then have that replacement hard drive take the place of the original. 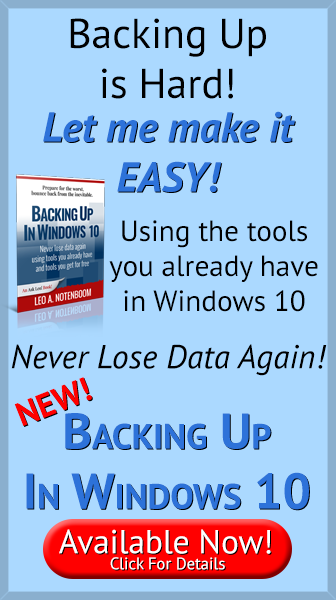 You create a nightly backup image of your hard drive. You replace your hard drive. You restore the most recent backup image to the replacement hard drive. The biggest caveat to this scenario is that the only thing that’s changed is the hard drive, nothing else. We’ve not “moved” the operating system to another drive — say from C: to D: — we’ve simply replaced the hard drive that is C: and put the data back on it. As I mentioned above, Windows is a very complex operating system, and installing it is an intricate process that involves more than just copying a few files. Things like hardware selection, registry values, and configuration options are all determined and written during the installation based on the characteristics of the machine at that time. Even if you were able to “move” the operating system to a different drive with a simple copy — say a second drive that you expected to dual-boot from — that move will invalidate many of the options that were originally determined at setup time. Sometimes Windows will recover some of the information as it notices something’s changed, but often it will not. The “right” solution to moving Windows from one drive to another, or from one machine to another, is to reinstall it from scratch. That’s the safest approach with the most stable result. Windows 10’s licensing further complicates things. When Windows 10 is installed, it’s issued a digital license for the machine on which it was installed. In theory, then, that copy of Windows cannot legally be moved to another machine. Chances are if you move a hard drive, copy an image, or even use some of the utilities that offer to move Windows from one machine to another, the result will be an un-activated Windows installation. 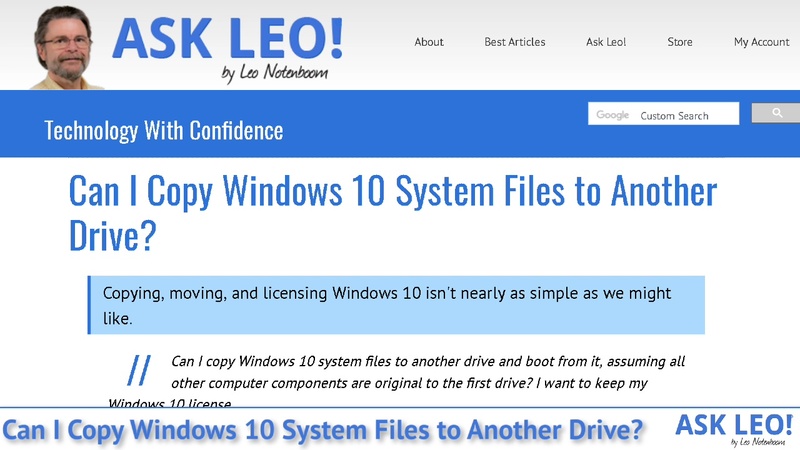 You’ll likely need to provide1 a new key to license that copy of Windows to the new machine. The interesting thing about the digital licensing model is that once you’ve installed Windows 10 onto a machine, you can then reinstall it on the same machine without needing to re-enter your key. The licensing monitor recognizes it’s the same machine on which Windows 10 had previously been installed and activated. To bring this all back to the original question, even if you were able to copy Windows 10 to a second drive in the same machine without replacing the original drive, and even if you were then able to boot from it, I expect Windows would consider it a different machine, and require a new license. Ultimately, you’d have two copies of Windows 10 on two different drives at the same time, which would imply a need for two licenses. Can I Simply Copy Everything on My Drive in Case Something Bad Happens? - There are in fact utilities that can do an actual clone of your computer, but I would prefer you move to a more traditional image backup system. 2: Typically, activation will fail, and you’ll be presented a phone number to call. Depending on the scenario, you can often make a case that it’s the same machine, and the digital license will be upgraded to your new configuration. Very interesting. But please read next. 1. As i had my current computer (four years old, specially built, with 4 hard rives), initially was Windows-XP pay upgraded to 7, 8., then 8.1, then 10 (32 bit as initially I had 32 bit Windows), once I got a message from Microsoft, that my Windows is not licensed. As I did not have the paper work for what was done before, I paid Microsoft for a license again, just to speed it up. It is still with Windows-10 32 bit and I preferred it that way, to avoid changing some programs that I had since Windows 3 and 3.1 that I could not find new versions of. 2. Now, I get with Optimize/Defrag of Windows-10, (OK, 2% fragmented) on my drive C: Although it is hardly 16% full (84% empty). I was told it is old and should be replaced. It is not critical till I get 5% or more. The Hard drive C: is 200 GB which is no longer available here in Canada. I will replace with a new larger HDD although it is hardly having anything but running software and Windows. My question then, copying an IMAGE of my current Drive C: onto a new HDD of larger capacity (and likely not same manufacturer) is going to work? Both will have “Primary” connection, Smoothly? Without having me to pay a THIRD TIME then to Microsoft for a new license AGAIN? If you simply replace the hard disk (not add, but replace), and use your imaging software to restore the image to the new hard drive, and then — if needed — adjust the partition size to match the new, larger drive, then I would expect it to work. If not, I would expect a call to Microsoft to activate the new configuration to work as well, no new license required. I once replaced a defective hard drive and installed Windows from scratch. I was asked for an activation code which the installation rejected. I phoned Microsoft in Germany several times and each time my request for activation was turned down. Finally, I used a VPN and got a different number via MS USA, and the tech happily activated the OS online. So, if you get turned down by an MS rep one time, don’t be afraid to keep going till you find a technician who is more sympathetic. You can purchase valid Win 10 Pro licenses on eBay for as little as $10. Sellers purchase licenses in bulk from MS as “OEM builders” and then resell them. All perfectly legal. After upgrading two devices from Home to Pro I bought two Pro licenses this way and they were both validated by the systems and are still working. I’d be careful about buying licenses on eBay. Before purchasing, make sure the seller has a close to 100% positive rating and has several hundred, or better several thousand sales. Otherwise, they might be sending bogus licenses. “Otherwise, they might be sending bogus licenses. – Whichever way you shake it, they *will* be selling you bogus licenses – somewhat bogus, anyway. Licenses sold in this manner will either be purloined educational or volume licenses or, in the best case scenario, OEM licenses which are not meant to be directly resold to consumers. Such licenses may not work at all or they may work for 3, 6, or 12 months. Or you may get lucky and they’ll work for as long as you need them to. About six months ago I bought a new WD SSD to use as my ‘C’ drive as my 6 year old HDD was getting noisy and slow. The drive package included a link to a free copy of Acronis True Image WD to clone the old drive to the new SSD. I used an inexpensive external docking station for the SSD and ran the Acronis program. The cloning process completed, I installed the SSD as the primary drive (just moved SATA connector from old to new drive) in the PC and booted. Worked perfectly! No issues whatsoever running WIN10 Pro. The old HDD remained in place and is now the ‘D’ drive. I had some serious problems with my computer running very slowly. I used to resolve the issue by returning to an image made months earlier, but that approach seems to be impractical now. Updates after the reinstall can take hours/days, and I often have issues with some updates not installing. Last time, I used TenForums Tutorials to download an ISO from Microsoft, using the Media Creation Tool, and burn it to a flash drive using RUFUS, then reinstalling win10 on a different hard drive. The tutorials mentioned that I might need to phone Microsoft, but I installed win10 on a new hard drive without contacting Microsoft. The drive has worked fine for over a month. The computer is a refurbished Dell T3500 that originally used win7. I upgraded to win10 during the time Microsoft was really pushing the upgrade. No install disks were furnished with the computer. From my experience, do not keep any image files for over a few months (or less) without installing it on a working hard drive, updating, and creating a new image file. If you have a desktop, purchase another drive for this purpose. You can connect it to an unused port, and use Setup to switch. If you are slightly uncertain about selecting the second drive, disconnect a cable to the normal C: drive, or remove that drive and use the new drive. Transferring/copying Windows x, especially 10, to a new drive can get more complicated than you have indicated if the Windows installation is “OEM” or Original Equipment Manufacturer. In that case the license is to the manufacturer. Take Dell or HP. They are providing the license. They have modified the installation and there are a copious amount of overhead and specialized programs that are included in the distribution. You really need to go to the manufacturer’s web site and get the image provided by the manufacturer. This may cost you $ to get real media. Reinstall that on the new HD. Before you do the reinstall, make sure you copy all your personal files and the AppData file to a backup flash drive of appropriate size. Also, run the Belarc program to take a snapshot of all the programs you have installed and all the licenses you have for those programs. Programs like iTunes require special handling to get them reinstalled on the new drive. You need to know how to do the install before you start. I know how to do it in my head and I know it is fairly complex in terms of doing installs and adding back the devices and music/videos recorded in iTunes. Find a YouTube video for instructions. With respect to Office, there are two methodologies, one for your own license of Office and one for the stupid Office 365 installation. If your Office came with your computing device, then Belarc will provide the license key you will need to enter. Sometimes, if you bought Office from the vendor manufacturer (eg Dell), you will have to enter the key provided by Belarc and cross your fingers that Windows accepts that as genuine. Otherwise, if you bought Office separate then you will need to have the Office key available. If you have problems, it is best to call or chat with Office Support. They can provide you with special authorization. By the way, you might have problems with Windows as well. Again, go to the Windows Support website and chat or call support if you have license problems. If you have an OEM licensed copy, you might have to contact the manufacturer. What I am saying is, don’t waste a lot of time trying to brut force the issue if you have a license problems. Go directly to the proper support authority. There is too much to this topic to provide a comprehensive solution to the problem of hard disk failure and subsequent transfer to a new hard disk. And, as I think about it, maybe the entire topic is moot: most people don’t need a computer; they can use a tablet or smartphone (plus bluetooth keyboard/mouse) that will satisfy their needs. Laptops and computers are dinosaurs for most people/users. When your HD dies, consider just throwing the dinosaur away and going to a tablet or smartphone.. Save your documents and pictures to a cloud service such as Google Drive, iCloud or whatever. And, if your HD drive failed, consider installing a Ubuntu distro instead. Your laptop or computer is probably at least 3 years old, and there is a Ubuntu distro that will uncomplicate your future and improve your system performance.